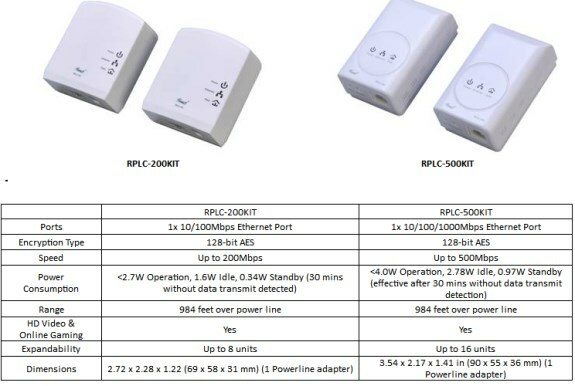 Rosewill announced the RPLC-200KIT and RPLC-500KIT, two new Powerline ethernet adapters that provide up to 200Mbps and up to 500Mbps, respectively. Rosewill®, the leading brand of PC Components and Peripherals and award-winning power supplies, computer cases, and gaming keyboards, is introducing Powerline Networking members, RPLC-200KIT and RPLC-500KIT. Joining Rosewill®’s growing family of wireless routers, switches, wireless adapters, and network adapters, Rosewill® is proud to present 2 additional members to complete a line-up of networking products for all networking needs. The RPLC-200KIT, a 200Mbps Powerline AV+ mini Wall-Plug Adapter which utilizes HomePlug AV technology and RPLC-500KIT, a 500Mbps Powerline AV Wall-Plug Gigabit Adapter, allows the expanding of high speed networks to multiple rooms through any home wall power outlet. The HomePlug AV+ technology brings up to 30% faster speeds than traditional 200Mbps AV Powerline adapter. The RPLC-200KIT and RPLC-500KIT Powerline adapters includes a Built-in Noise filter to reduce power interference and enhance data transmission quality, secures data with a 128-bit AES Encryption, and QoS support. QoS allows prioritization of services that are important and ensure lag free use of VoIP, video streaming, media streaming, or online gaming. The RPLC-200KIT’s and RPLC-500KIT’s push button setup will have your network extended and up and running within seconds with a simple push of a button on each pair. The slim size is designed to save room for your limited power outlets and also save power with its Power Saving mode when idle. The RPLC-200KIT and RPLC-500KIT Powerline adapters are the perfect solution for those looking to extend their network where wireless is weak or cannot reach nor have the ability to install extensive wiring of networking cables to stream High-Definition media and expand high speed internet access by utilizing the wall power outlets available in every home.